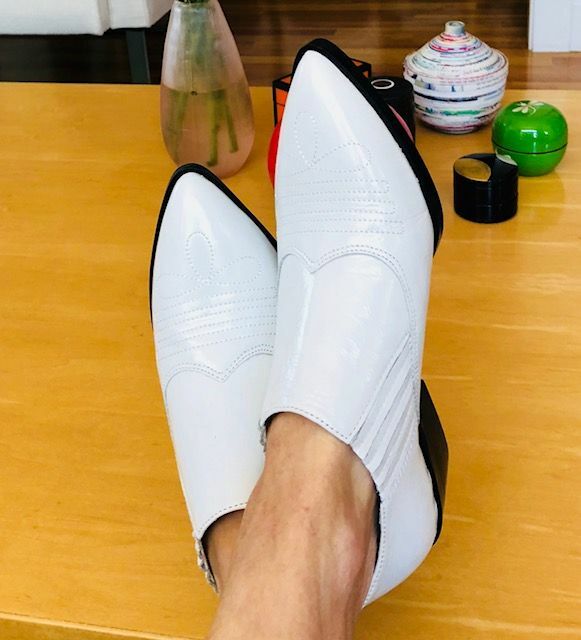 The white cowboy shooties that pander to my '80s gene. Look at the great fit BAREFOOT. It's been a shoe and dress jackpot for me this year. All good things come to those who wait! 3.1 Phillip Lim INK BLUE Skirt (in Nordies dressing room). 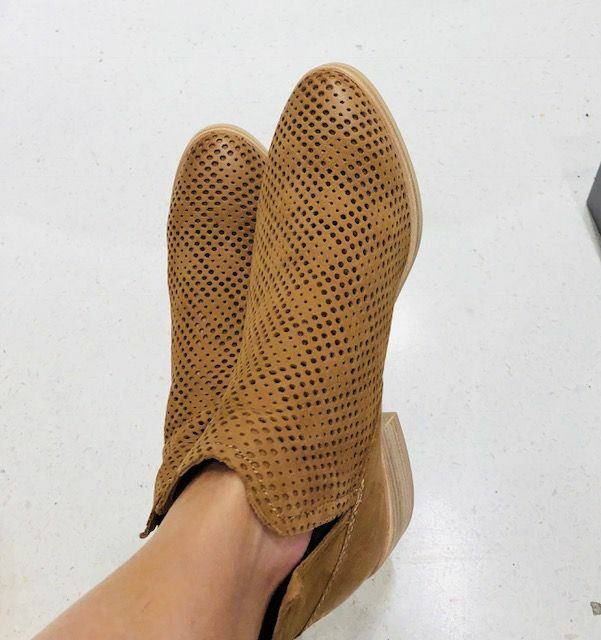 Dolce Vita perforated booties (in Nordies footwear dept). J.Crew striped knit top that I wore with white jeans, old green specs and new lemon mules on Saturday. 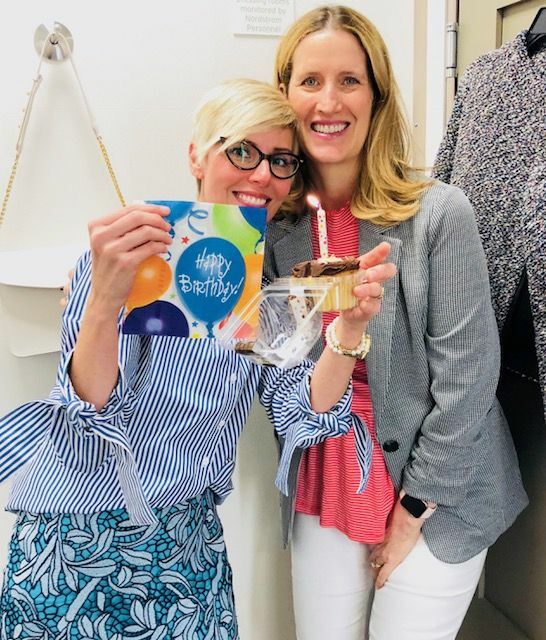 Birthday fun at the NAS with client and friend Bridget last week - who brought me cake for breakfast and a pezzie. LOVE MY NAS LOOT. I'm a lucky fish. (All my NAS items in Finds here - and waiting for the duplicate 1901 dress in red and the stripe). I'd be smiling that lovely smile too! So great to see your loot! Thanks for taking the pictures. Love seeing the TopShop dress poke out in 1&2. That's sweet, Angela. Thank you. Kathie, HAH. Aren't you observant about the dress I'm wearing right now. I love the ML dress on you. What a great NAS for you! Your green & white striped top looks GORGEOUS styled with your green glasses and white pearl neclace. Lovely pieces Angie. The bootees are fresh and the stripes are great to see. The blue skirt and blue and striped shirt is gorgeous! Oh, I love those white boots, I would totally wear them! Gorgeous!! On my phone but back soon for closer look!! You really had an amazing NAS. The skirt is so much nicer on you than in the photo. Wow, wow, wow!! And on the green matching the glasses, it doesn't get better than that. Booties are fantastic and dress looks amazing on. You are going to have such a good time getting dressed every morning!! Because you have so many new and special pieces, it will take months to play with all the various options between NAS and b'day loot!! What fun!! And happy, happy, happy belated birthday again!! I think we should all get to celebrate for at least a month!! Enjoy!! Your beautiful new wardrobe pets will make it a fun fall. I see some toffee but not as much light blue. Birthday cake is the best! Thanks for showing us your amazing pieces, Angie. Loved to see the ML dress, and the 3.1 Phillip Lim skirt on you! And your birthday outfit is so fabulous, I could barely focus on the cake. Gorgeous, haul! Those white booties are fantastic and that midi dress—wow! love everything! That green striped top with the green glasses is the definition of happiness! So pretty and fun. And I LOVE the ML dress on you -- fantastic! It looks so elegant yet so comfortable! The footwear's terrific, too, and the skirt is so floaty and romantic. Love the photos of you and Bridget, too -- so cute! That Anthro skirt is such a beauty. The boots and green stripe... the catalog pics do not do them justice! Each of your choices is (of course) such a great fit with your style. Very inspiring. The top is just adorable with your green specs and haircut. And I LOVE the watermelon flats with the dress, that’s such a cute look. Are they suede? 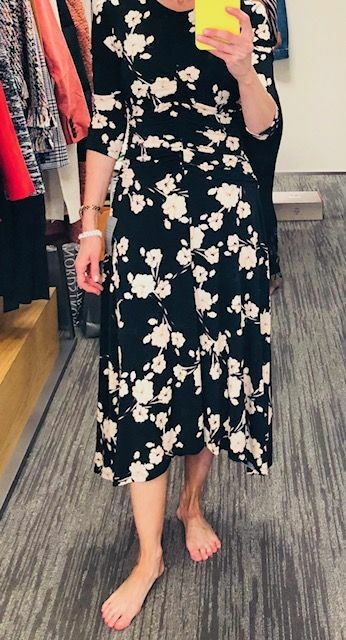 I’m on the lookout for something similar, though probably in blush or pink rather than a bright (which I’m sure I’ll be able to find on sale at Garnet Hill or Boden). I love seeing these photos of you in your NAS goodies. 2. ok, the white boots. 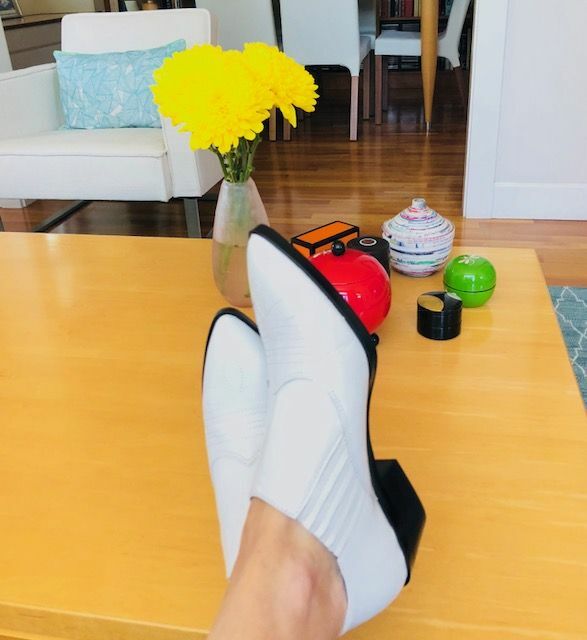 I'm trying to broaden my scope here, because I know that the white bootie in a bunch of iterations has been trending for the last couple of seaons...and I like the IDEA of it, but can't wrap my head around how I would style them. Yours look so cool on you . I am not an 80's lover - I know you are - that decade did nothing for me fashion -wise, but tell me how to style these boots. What are you wearing them with ? How would I wear them myself? 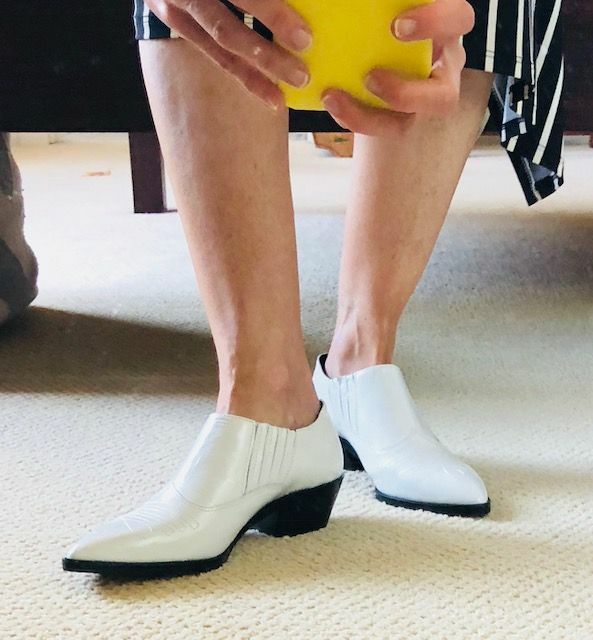 The white shooties - oh my - truly fab! The green top and your green glasses are really cute together, too. Thank you for sharing. It’s fun to see what you got. I do love the green and white tee with the green glasses - that is my absolute favourite!! I totally agree the skirt looks stunning on you and has lots of possibilities for styling with boots and booties, loafers and ballet flats. And I really like the perforated boots too. How fun to get a cake in the morning and what a great photo with Bridget!! You really scored with the shoes this sale, and that Phillip Lim skirt was a worthy splurge. Just beautiful! 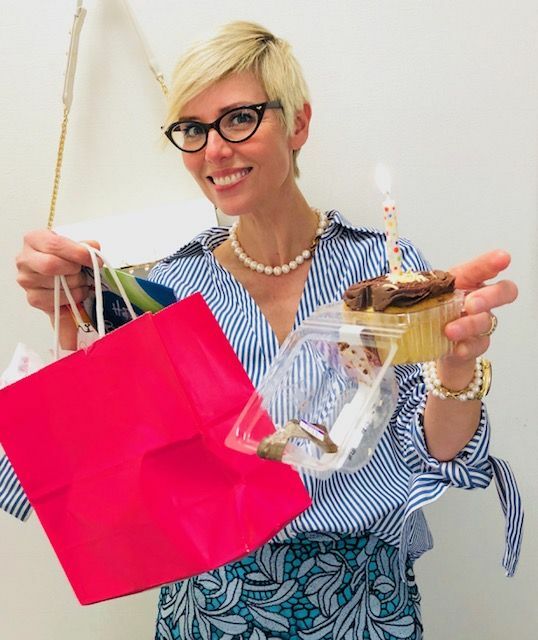 Nice haul, Angie! 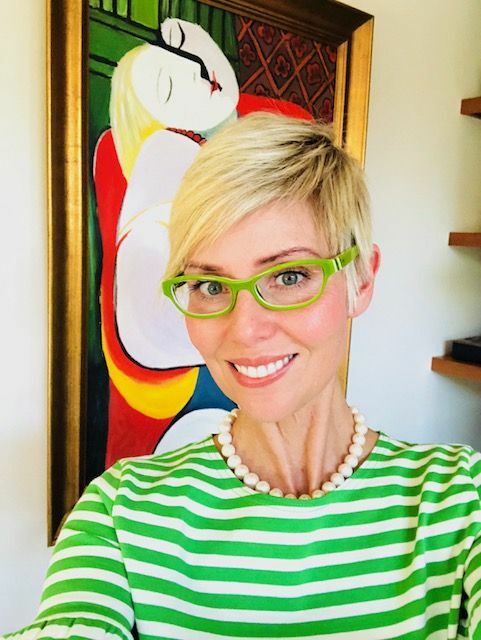 Your green striped top is just perfect with your eyeglasses. The skirt and dress are lovely on you and what a fun BDceleb picture! The green stripe top is very cute on you! I’m also quite intrigued to see your style evolve to include some earth colours. Fabbo. Question re the white booties; do you think they could work with cropped business casual pants? Or dresses? Or are they a little too casual/trendy? 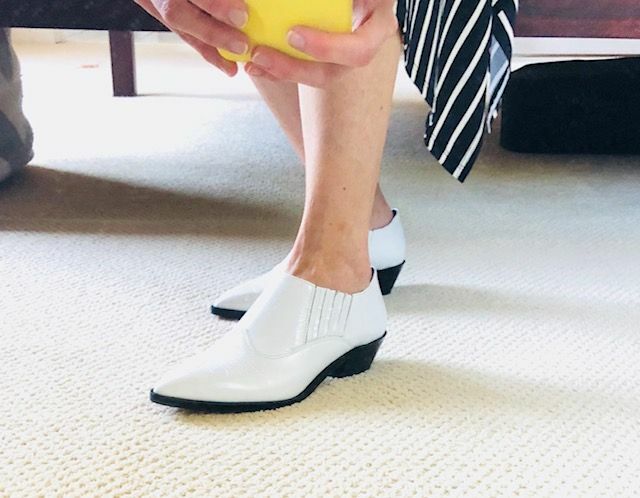 I am still on the hunt for a pair of white booties that go well with cropped pants for both work and weekend wear and work dresses. Love your NAS Stash! That green striped top with your green glasses is happiness. I think of you every time I see that color green. The white booties look great on you. I am laughing because I had a pair in black that looked and fit exactly like these, even the same heel. Pretty sure I bookended them with big hair. Love all of these. I would wear the white boots with the Phillip Lim skirt, which is amazing. A beautiful collection of pieces that fit you and your style perfectly. What a fabulous bunch of items Angie. No wonder you’re so happy! That Phillip Lim skirt is tdf.